In Albuquerque, where on average 128 or more vehicles are stolen per week, I never thought I would be just one more “vehicle theft” pushpin on the crime map. Unfortunately, I was wrong. On this past Tuesday morning, I set out for one of my favourite thrift stores, where I frequently find a good cache of used cookbooks to add to my collection. I had been having some foot problems, so when I found a parking space in the first row, about 6 spots down, I was pleased that it was so close to the store entrance. As ALWAYS (!) I locked all of the doors and made sure all of the windows were closed: not even open a crack. 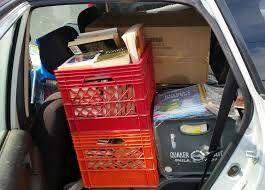 After 20 minutes of browsing, and having made my selections, I paid for my treasures and headed out into the parking lot, toting my stack of books. I proceeded in the direction of my car, but wait. The spot where I had parked my 1995 Saturn was now empty. Puzzled, I set my stack of books down on the curb and scratched my head. I knew it was in that spot 20 minutes ago. However, worried that early dementia had set in, I loped around the parking lot searching for my car, all in vain. It was GONE! Not a trace, not even any remnants of broken glass. Just GONE. My heart sank. After calling my spouse for support (and a ride home), I contacted the Albuquerque Police Department, who sent two pleasant officers a relatively short time later to get the details of the whole sordid event. They were not optimistic about its recovery. My spouse and I made additional scours of the parking lot, but there was not a Saturn in sight. I even made one more trek back later in the day, but nothing. Prior to this, maybe 4 or 5 years ago, I came out of my former residence one cold February morning to go to work, and noticed that there was dusting of snow on the front passenger side of the car. I also noticed that it was very windy inside the car. The front passenger window had been smashed. Having read an article about vehicle theft in the USA a few weeks earlier, I felt pretty smug at having gotten off so easy. Both my spouse and I have always driven cars with manual transmissions, as we are more comfortable with them. The article I read, however, noted that these vehicles were among the least stolen on average for the simple reason that 59% of those individuals arrested for auto theft are under the age of 21. By common consensus, it seems likely that most in this age group had never even seen a manual transmission, let alone operated one. Thus I was feeling pretty confident that my Saturn was relatively safe from abduction. 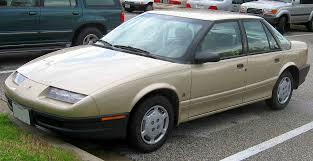 I purchased the vehicle when I first arrived in Albuquerque, from Toronto, in 1994 and its been with me ever since. Although cosmetically it looked a little tired, it had never been in an accident or otherwise sustained any damage, but it was clean, in excellent running condition, I had taken good care of it for 22 years, and it was mine. You might be wondering what all of this has to do with my cookbook collection. Well, everything. 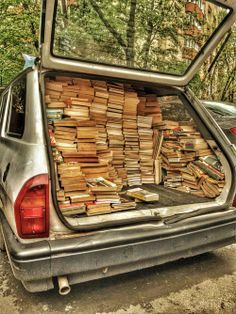 When I began my first collection back around 1995, I had amassed somewhere in the neighbourhood of 1,500 books, almost all of them transported in my Saturn. Due to an unfortunate set of circumstances, I felt I needed to part with them in 1999 and donated them to our local “Friends of the Library” (they promptly had a well advertised cookbook sale, at which time my spouse had to practically tie me up so that I wouldn’t attend and buy them all back). 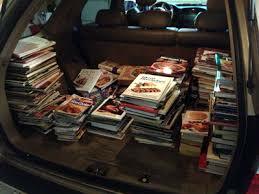 Over the past 7 or 8 years, as I grew my second collection, my little Saturn rightfully earned the title of “cookbookmobile”, repeatedly hauling stacks of books from numerous thrift stores to my humble abode. 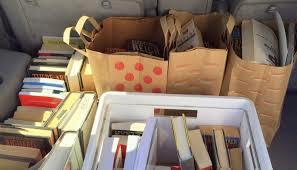 Books in the front seat, books in the rear seats, books in the trunk, books on the floor, books in bags, books in boxes, loose books, my Saturn was there for me. Now it is gone. 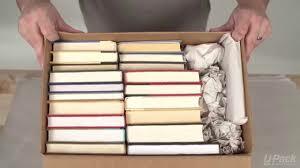 It just won’t be the same without my constant and long-serving cookbook-toting companion. Sigh. This entry was posted in Collecting, Collections, Cookbooks, Cooking, Guinness World Records, New Mexico, Uncategorized, Vintage Cookbooks and tagged Albuquerque, Auto Theft, cookbooks, Guinness World Record, New Mexico, Saturn Vehicles, Sue Jimenez, Vintage Cookbooks. Bookmark the permalink. Sorry about your car. I have a nice collection of cook books. I use them all the time as inspiration for my food blog. 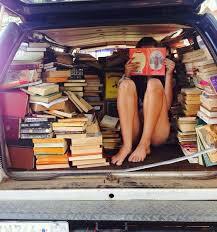 I buy them only at thrift stores and keep a list of what I am looking for. I enjoy the hunt probably more then anything. You just don’t know what will turn up.